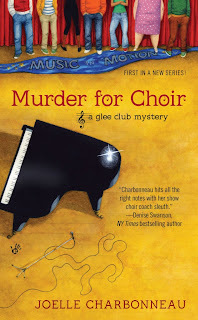 Murder For Choir is a cozy mystery that exceeded my expectations! I've never quite known what to think about mysteries; I love them but I always worry whether the facts and details will bore me or the suspense will just scare me to pieces. Fortunately, Joelle Charbonneau has captured my attention as a stellar author and made mystery one of my top favorite genres! Paige Marshall is a career performer turned show choir teacher. She's the new director for Prospect Glen High School's Music in Motion team. It's not where she wants to be, but she sure makes the best of an unfavorable situation. Doing everything in her power to win her group over, she even resolves to solve the murder of a rival choir director. For the first book in a new series, Murder For Choir jumps right into the story without a lot of background information to lead in. It was surprising, but completely welcome, to get to know Paige in her present situation before learning about what led her to the Chicago suburb of Prospect Glen. Charbonneau doesn't leave readers hanging, though, inputting Paige's personal information as the story progresses. The biggest part of Paige's amateur sleuthing is that she takes the initiative. The lead detective on the case, Mike Kaiser, may have told her to keep her eyes and ears open, but Paige does more than that. She ferrets out clues and suspects all while preparing for the start of the school year. Her determination is unbelievable, especially since the murderer isn't too happy to discover Paige's investigation. Just about every character introduced is seen as a potential suspect so it's almost impossible to figure out the culprit until the end. I love feeling like I'm on the same level with the character, knowing facts as she learns them and putting the pieces together at the same moment. The story was already shaping up to be fantastic, but once Paige's love life got a little wild the story became even more superb! Murder For Choir doesn't only appeal to show tune and Glee fans, but mystery and suspense lovers, too. I'm looking forward to the next bout of trouble that blows Paige's way in the next installment, End Me A Tenor! I’ve always loved puzzles. As a kid, I would spend hours putting the pieces together. Even though the front of the box told me what the end result would be, I was still fascinated by the way the picture took shape. First creating the framework. Then filling in the picture bit by bit from the outside in until that final piece is clicked into place. Considering my lifelong love affair with puzzles, I guess I’m not surprised that I am drawn to reading and writing mysteries. The construction of the whodunit aspect of mysteries is built just like those puzzles I’m so fond of—except in the case of a mystery there is no handy-dandy cover of the box to show you what the assembled puzzle will look like. You have to figure that out all on your own. The characters of each mystery are like the puzzle’s outside frame. Your sleuth, either amateur or professional detective, and the people who your character associates with are the foundation of the mystery. Just like that external puzzle frame, if those pieces don’t fit together properly, nothing about the puzzle will fall into place. I have to admit that I borrowed from my own life experience to create the characters that form the frame of MURDER FOR CHOIR. My sleuth, Paige Marshall, is a classically trained opera singer. While waiting for her big break, she takes a job as a high school show choir coach. Yep—you guessed it. I am a classically trained opera singer and I am typing this post as I wait for one of my voice students to arrive. The frame (aka characters) gets even stronger when you begin to add the other pieces. I don’t know about you, but when I am putting together the middle section of a puzzle, I always start with the sections with the most obvious pieces of the picture and go from there. In the case of writing a mystery, those pieces are the crime. In the case of most mysteries, including Murder For Choir, the crime is…well... a murder. Why? Because murders are compelling. They draw both the reader and the characters’ attention and require some kind of physical or emotional reaction. When the most obvious sections of the puzzle have been built, it’s time to put the rest of the pieces into place. These are harder. This section of the mystery is when the sleuth is digging through suspects and finding clues. Sometimes they pick up a piece they think fits in a certain way, then realize that it doesn’t quite snap into place the way they believe. Those “almost” clues can lead the reader and the characters to imagine the picture is going to look one way, but as the rest of the pieces fit into place, they understand the picture isn’t quite what they’d thought. Balancing all those pieces together—the characters, the crime and clues—can be a challenging trick. If one piece doesn’t fit exactly right, the rest of the mystery tumbles apart. Which makes writing mysteries scary and fun and exciting. I can only hope that when the reader puts the pieces of MURDER FOR CHOIR together, they’ll not only be guessing until the last image clicks into place, they’ll be having a blast while they do it. See Joelle sing as 'Grace' in ANNIE!